When your vacuum cleaner breaks down it can be time consuming and expensive finding and getting it fixed by a professional. Many problems with vacuum cleaners are straightforward to fix if you know what you are doing. 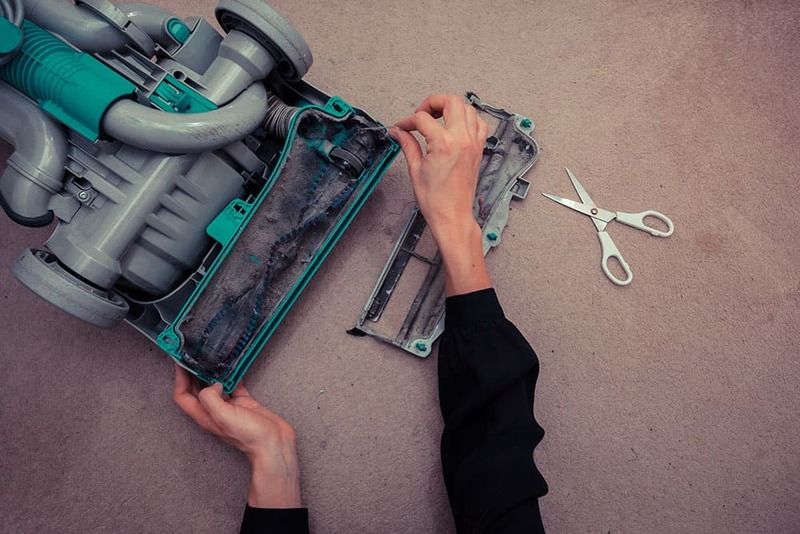 If your vacuum cleaner stopped working or is not picking up as it used to then we recommend reading through this easy-to-follow vacuum repair guide to see if you can have a go at fixing it yourself. You could have it back in perfect working order before you’d driven to your local vacuum repair shop! WARNING! if your vacuum is still under warranty you should not attempt your own repairs (other than simple checks and routine maintenance & servicing). Instead you should contact the manufacturer to find a local authorised vacuum cleaner repair shop to carry out the repair. Remember, regularly servicing your vacuum will reduce the likelihood of major breakdowns. We’ll tackle each of these in turn and show how these are usually easily solved. Before commencing vacuum repair, find a suitable place in your home to do the work. Expect there to be some dirt created during the repair work and so you should dress accordingly! If you are doing the work inside your house then take care to protect your flooring and furnishings with a sheet or tarp to capture any dirt. We would also recommend wearing a dust mask, which is essential if you suffer from allergies. Ensure that your vacuum cleaner is unplugged from the electrical outlet before undertaking any vacuum repairs! It's important to regularly check your vacuum’s dirt bag or bin and either replace or empty it when full or suction will be impaired. If your vacuum is not picking up start with replacing the bag or emptying the bin. If you have a bagless vacuum cleaner you should also clean the cyclone to remove any dirt and dust that has built up. Bagged vacuum cleaners can begin to lose efficiency when their bags are only one third full! 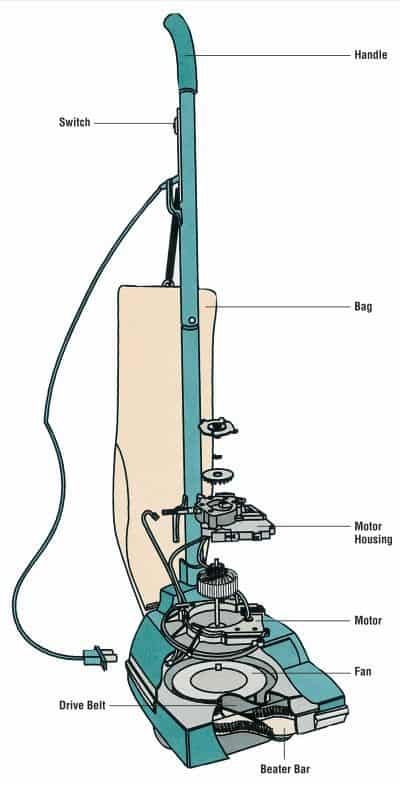 In a bagged vacuum, the air must be able to pass through all the collected dust and debris inside the bag. As the vacuum cleaner fills the bag with dirt it has to work harder to force the air out through the microscopic perforations and there is a limit to how full the bag can get before the flow of air is compromised. 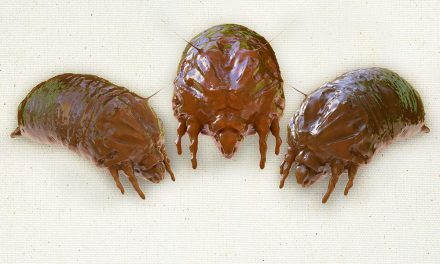 Some bagged vacuum cleaners perform better than others in this regard and have multi-layered bags that can be completely filled without loss of suction. As with the dirt bag, air must be able to pass through the filters in your vacuum in order for suction to be at its optimum. The dust that the filters capture needs to be removed regularly to ensure this is possible. Modern vacuum filtration systems consist of two filters (common terms are primary & secondary filters or pre-motor & post-motor/ exhaust filters). Both will need to be cleaned or replaced. Vacuum filters come in various shapes and sizes and are sometimes housed in a plastic frame or container that holds them in place. Cartridge filters and most HEPA filters simply need tapping on a hard surface or the edge of your trash can to remove the dust. Do not attempt to wash your HEPA filter unless your vacuum manual specifically states to do this. Washing a HEPA filter will render it useless in most instances. Other filters may be washable and, once dried, can be inserted back into place. If you have washable filters it is useful to have a spare that you can immediately use whilst the dirty filter is being washed and allowed to dry. If they are damaged, they must be replaced. Another common problem that is often overlooked is a blocked filter outer casing. If this is blocked it will prevent the air flowing through your clean filters. 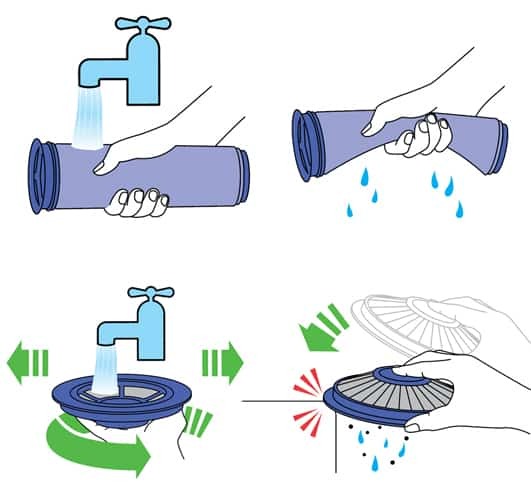 Hold the casing up to the light to ensure that the slots or holes to allow the air to flow are clear - water should easily drain through these holes if you hold it up to the tap. Filter B (filter that is housed in the cinetic ball) - should be rinsed and tapped out until the water runs clear, then tapped out again to ensure all excess water is removed. This will normally require up to 10 rinses. NB: Do not dry the filter in a tumble dryer, microwave or near a naked flame. 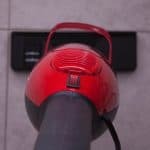 Another common cause of a powerless vacuum is foreign objects such as screws, plastic, paperclips, coins etc that are stuck somewhere in the vacuum’s airflow route and blocking or restricting it. First check the hose by stretching it out to full length and pushing a broom handle or other long pole through it. Do the same with the extendable wand. This will push out any obstructions that may be blocking the hose and confirm that the air path is clear. For an upright vacuum, carry out a full inspection of the vacuum cleaner head by turning it upside down. Most uprights have a rotating brush, which should be removed to enable a full inspection into the unit. Remove the cover plate that is fitted over the brush roll using a screwdriver. This will provide access to the rotating brush, which can be removed by carefully lifting it out of the locating channels at either side of the brush and removing the drive belt at the same time. 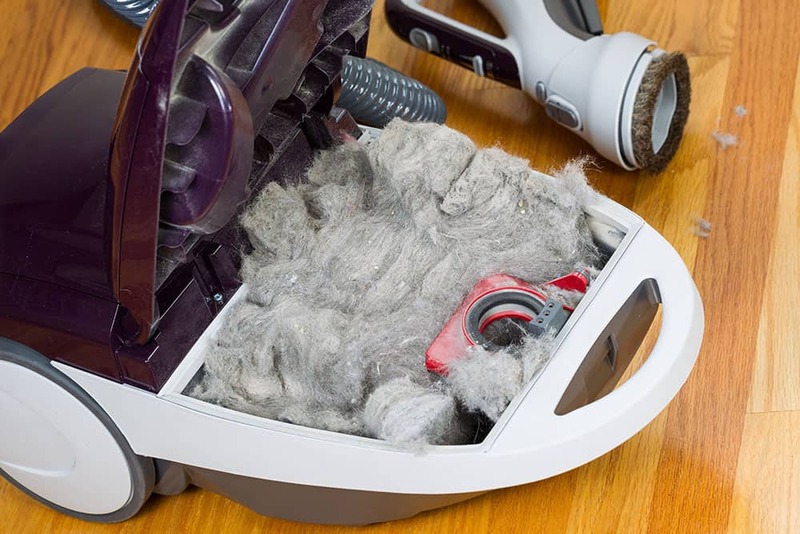 Once the brush roll is removed you should be able to see if there are any obstructions deep within the vacuum cleaner blocking the airflow path. Clear out any trapped dirt, debris or other items that you find. Before replacing the brush roll and drive belt, inspect them for damage and wear and use your judgement as to whether these need replacing with new spares. 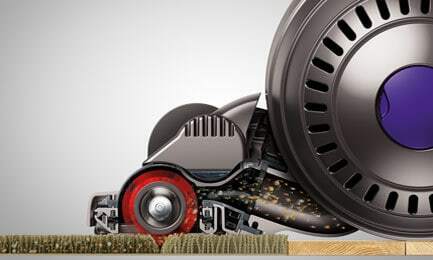 If you replace the brush and drive belt this can make a real difference to the performance of your vacuum, especially if it hasn’t been serviced in over a year. However, if the brushes still look in good condition and the brush roll moves freely when in its locating slots then you can just clear it of any dirt, hair or yarn that has built up around it before re-fitting it (you may need some scissors for this!). The drive belt should feel elastic, not tough and rubbery and needs to be a tight fit around the brush roll. If your vacuum roller is not spinning properly this is usually due to a loose drive belt.. If you decide that new spares are required, make a note of the model number of your vacuum cleaner. Then you can order a new brush roll or belt online (Think Crucial are a specialist online stockist of vacuum cleaner spares and worth checking out) or pick one up from your local vacuum repair shop. If you’ve followed the above steps there’s a good chance that your vacuum will be back performing at its best. However, even with a clear airpath and filtration system a vacuum with air leaks will not have full suction. It's common for vacuum hoses to have air leaks, which could be from cracks or holes or due to a loose or poor connection between the hose and the vacuum. By carefully inspecting the full length of the hose and the connections you may be able to see or feel holes, cracks or tears. If you cannot see or feel any holes but are still suspicious that there may be a leak you could fill the hose with water in the sink and look for water leaking out. If you discover damage to the hose you will then have to choose whether it can be repaired or if a new one is required. Small holes or cracks can be repaired using some duct tape but are only really a temporary solution. Larger leaks or problems with how the hose connects to the vacuum are best solved with a new hose. If you are keen to try a repair, here is a nice guide to fixing a leaking vacuum hose. There may be other small leaks within the vacuum system that contribute to the loss of suction and you should check that all components are fitted correctly. Common culprits are a poorly fitted bag, bin or filters that are not completely sealed. Why does my vacuum stink I hear you ask? Well, there are generally two types of bad odour from vacuums - dirty smells or burning smells. 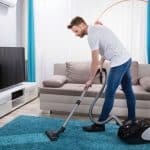 If your vacuum smells like dog or has some other nasty odor this is usually due to a dirty or blocked vacuum cleaner that is emitting the smell of all the hair, fur, bacteria and other stinky substances that it has sucked up. 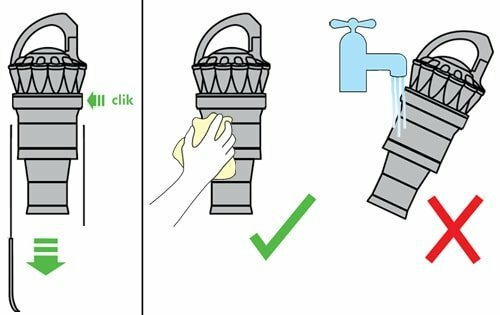 The first step is to check the bag, bin, brush and filters as outlined in the above steps, however you should be certain to replace the bag if you have one, rather than simply emptying it. 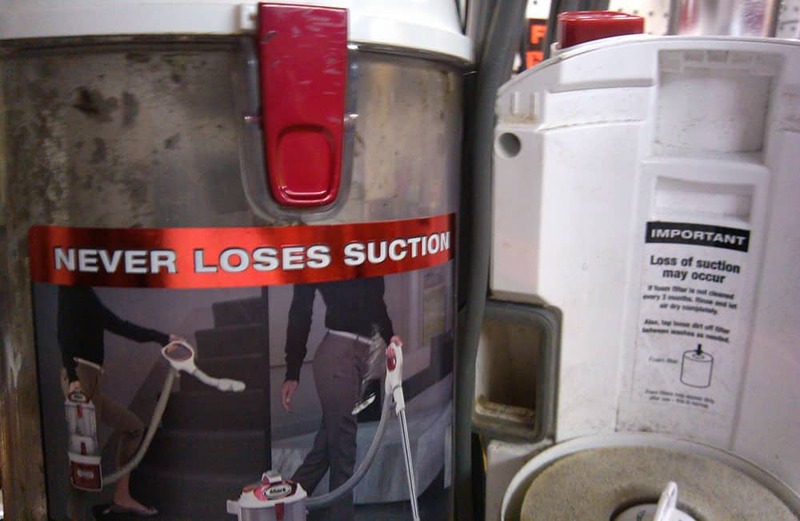 If your vacuum has a bin you need to empty and thoroughly wash it with clean water. Give the vacuum cyclone a good clean with a damp cloth or as directed in your vacuum manual. Clean the cyclone shroud with a dry cloth or dry brush to remove lint and dust. You may also need to replace the filters if they are the cause of the odour and washing them does not remove it. Even washable filters need replacing from time to time. Always ensure that filters are completely dry before re-inserting them. This can sometimes take as long as 2-3 days so it's best to carry a spare to swap with. It’s also possible that the brush roll is contaminated with bacteria or other substance causing the stench. Again, you will need to ascertain if the brush can be adequately cleaned to remove the problem or whether it needs replacing. Furthermore, if you have a bagless vacuum cleaner then give the bin a thorough wash out after emptying and allow it to dry before replacing. If replacing parts such as bags, brushes and filters be sure to use only genuine original spares. Generic versions will be lower quality and not a perfect fit for your vacuum, which will mean a less than perfect performance! 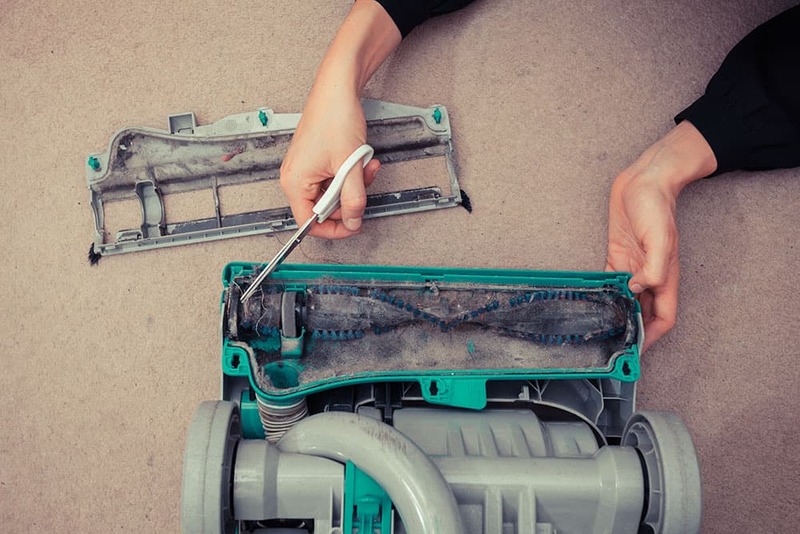 Once you have cleaned or replaced these key components and ensured the air flow path is clear then there is little reason for your vacuum to be emitting a dirty smell. To really bring the freshness back, you could also consider buying some scented tabs for your vacuum. 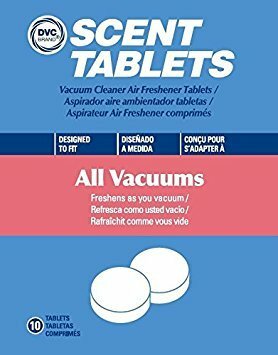 These tablets go inside your vacuum bag and give out a fresh pleasant odour, which will be emitted from the vacuum’s exhaust during cleaning. Some vacuum manufacturers offer scented filters or air fresheners for their cleaners so check what is available for your particular model. If you don’t want to go to the expense of buying scented products you could always try using some cinnamon or fresh herbs instead, which is reported to have the same effect. If you notice a burning smell coming from your vacuum cleaner then there can be a number of different causes. An obstruction may have lodged inside the vacuum preventing the drive belt from functioning, with the resulting friction causing a burning rubber smell. The drive belt could also be worn and stretched causing it to slip against the bearings and may need replacing. Check the tension on the belt is adequate to turn the brush roll at high speed. The brush roll may be tangled up with hair or yarn again causing a friction burn odour as a result. 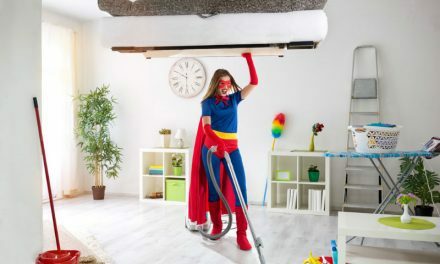 A dirty vacuum puts pressure on the motor if the filtration system is blocked resulting in an overworked motor, which can eventually lead to motor burn-out. So you should ensure that the vacuum is clean and has a clear airway by following the vacuum repair advice above. Burning smells can also be a sign of a wiring problem. Feel for the temperature of the electrical plug with the vacuum running and if this is excessively warm unplug the vacuum and check the electrical terminals in the plug. Tighten any loose terminals. If you’ve checked all of the above and are still experiencing burning issues then this could be a problem with the motor, in which case it is best to take this to a vacuum repair shop. Vacuum cleaners are quite noisy machines, some noisier than others. That is when they are in full working order. 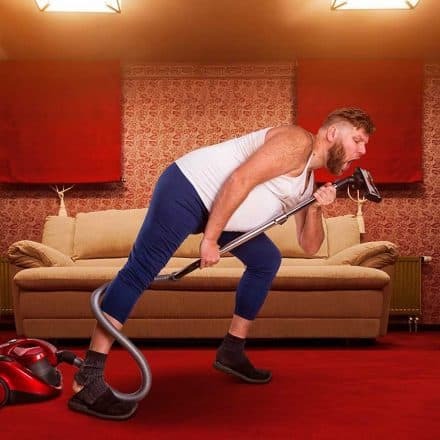 However if your vacuum cleaner suddenly becomes much noisier than normal it is a sure sign that something is wrong. 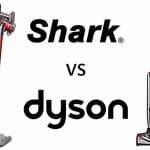 There can be varying causes of a noisy vacuum cleaner, ranging from a simple blockage or obstruction to more serious problems with the motor or fan. You should first follow the above vacuum repair steps for loss of suction to rule out a blockage, air leaks or broken roller as the cause of the noise. 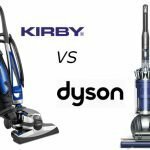 If the vacuum has no loss of suction and appears to be working correctly but is still very loud then the problem is likely to be related either the fan or the motor or even both. To determine if this is the cause of the problem you need to expose the fan and motor by removing the vacuum cover. ​Determine the location of the fan and motor in your model of vacuum by checking the manual. 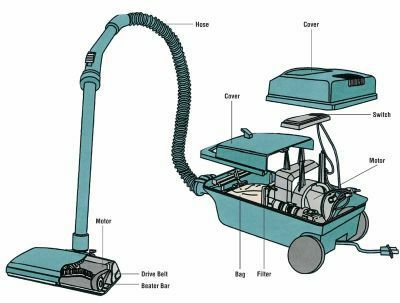 Also refer to the diagrams at the end of this vacuum repair guide or the videos below that give an indication where to look. Unscrew all screws that secure the plastic housing of the vacuum cleaner and remove covers and other components as required to access the motor. Inspect the fan blades for damage or wear and check that it is not loose on the motor spindle by turning it with your hand. Worn or damaged blades will cause a noise as they are not able to rotate smoothly and freely and they will interfere with normal dirt flow through the cleaner. Worn motor bearings will have a loud grinding sound and if you are able to diagnose this a major repair is required. If you’re vacuum’s motor bearings are damaged then this will likely require a new motor, which can be nearly as expensive as a new machine. 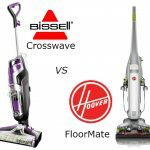 If this is the case then our Ultimate Vacuum Buying Guide can help you find the Best Type of Vacuum for you. However, sometimes motor problems can be solved by replacing the motor brushes if they are worn. The symptoms of worn carbon brushes can be burning smells and/or smoking and/or sparks from the vacuum cleaner or it may sound like the motor is slowing down. Replacing motor brushes is a fairly routine servicing procedure but is best undertaken by a professional unless you know what you are doing. This video from TechDIY shows you how to remove the carbon brushes from a Dyson motor so that they can be replaced with new ones. Access the back side of the switch by removing the cover plate. The switch may be on the handle or on the housing and will be shrouded by a cover, which should be removable via screws or rivets. Ensure that the wires into the switch have a good connection. Use the multi-meter to test for continuity and that there is an open circuit when the switch is off and that the circuit is closed when it is on. If you find that the switch’s circuitry or wiring is faulty then this will need to be replaced with a new one. Look for the correct spare for your specific vacuum model online or at your local vacuum repair shop. You should also check the electrical outlet by removing the plug’s cover and ensuring all of the wires have a good connection and the terminals are tight. Make any corrections and replace the plug cover. You should also ensure that the lack of power to your vacuum is not due to a faulty electrical socket in your home by trying another one. This can cause the motor to be starved of air, which causes it to overheat and cut-out to protect the motor. This is why after a short period, the vacuum may start working again but then soon cut-out once more. 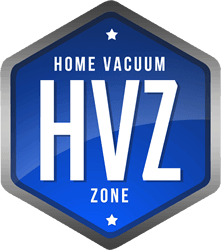 Vacuum cleaners with HEPA filters are more prone to overheating as this filter is very dense and causes extra work. Follow the above vacuum repair instructions for loss of suction to ensure you don’t have an airflow problem that is causing the motor to cut out. NextWhere are Miele Vacuums Made?